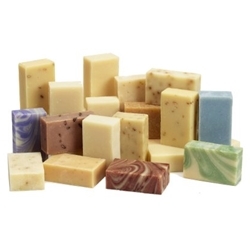 One just cannot beat the quality and feel of hand crafted soaps. Grandmas Pure and Natural Soaps are no different. Manufactured in 70 miles from us in Tulsa Oklahoma, Grandma's Soap is a pure and natural soap made with no added chemicals or detergents to irritate skin. Leaves skin feeling soft and clean! Select your favorite fragrance blend and enjoy.